Recently it has been set up a new clay brick plant in Malaysia equipped with Verdés machines. It is Hap Kee company, an old Verdés customer who again trusted on our solutions and experience to give shape to its new project. The new factory has a capacity of 700 ton/day of fired product and will produce mainly solid facing and structural clay bricks. 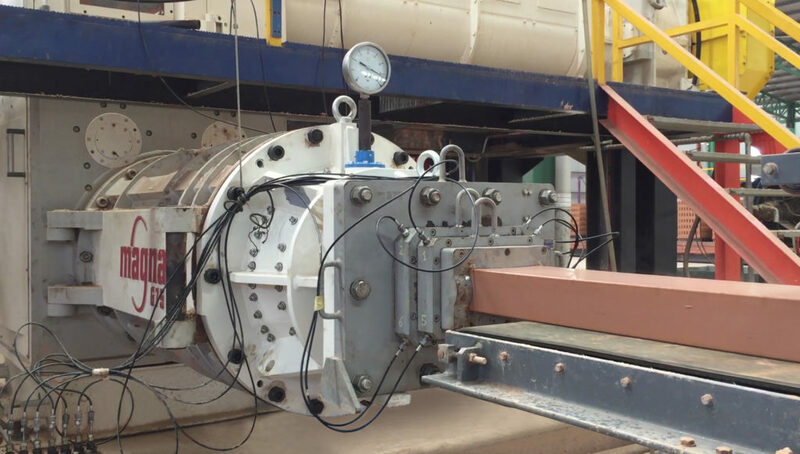 Verdés supply covers the entire clay preparation and shaping line which has been designed for carrying out a direct setting on kiln cars, which was one of the client’s requirements. It is a semi wet clay preparation process that has the following main stages: clay reception and primary crushing, secondary crushing and mixing with water addition, stocking, fine rolling and finally, the extrusion. For the primary grinding phase, it has been set a primary crusher 117-FT that allows reducing the clay lumps under 80 mm. Following this machine, a disintegrator 127-C reduces again the material until 5-10 mm by accomplishing a shearing action. During the secondary grinding, granulometry gets even more reduced and right after, the clay is stocked in a ground storage room, where its humidity content gets homogenized and its properties improves. From the ground storage room, the clay is conveyed to the shaping area that starts with a mixing and homogenizing equipment 046-C and continues with a roller mill that ensures a particle size without neither crusts nor aggregates. And finally the clay, perfectly conditioned, is processed by two extruders Magna 675 with vacuum chamber, specially designed to work with stiff extrusion beyond 30 bar. Direct setting consists of using the same kiln cars for transporting the raw or green bricks from the extruder to the dryer and after that to the kiln, without any loading and unloading in between. It is a process used in several installations as it allows low investment in loading and unloading mechanisms, it reduces overall maintenance at the plant, optimizes the production process and it permits continuous and simultaneous production processes. Verdés has decades of experience in the supply of machines and solutions for brick plants that perform direct setting on kiln cars. At Hap Kee’s plant this system is designed for loading bricks produced with clays with low drying contraction, high mechanical strength and the option to extrude with little humidity under high-pressure. Something that can only be performed by extruders specially designed and prepared to work with beyond 30 bar, as both Verdés Magna and Magnabloc extruders are.